Feeling awestruck by the ferris wheel. Making plans to attack York, one shoulder-ride at a time. Working on his mastery of walking up and down stairs on the castle grounds. 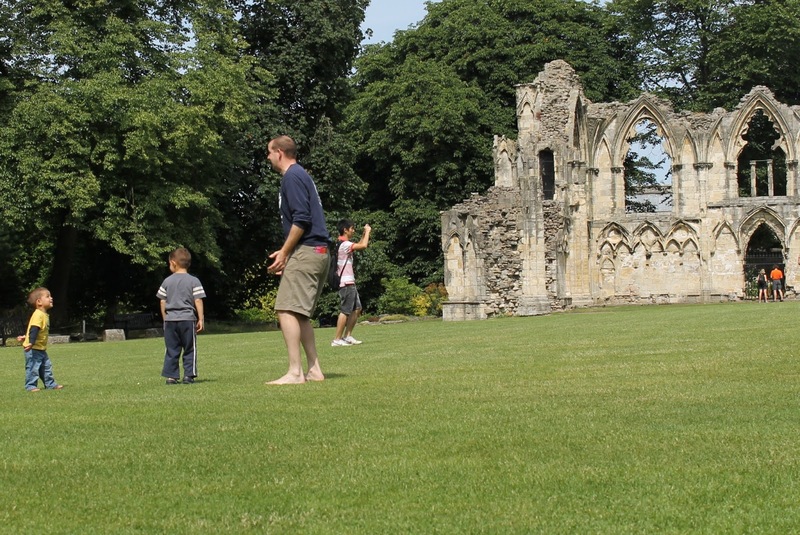 Playing tag in front of centuries-old monastery ruins. 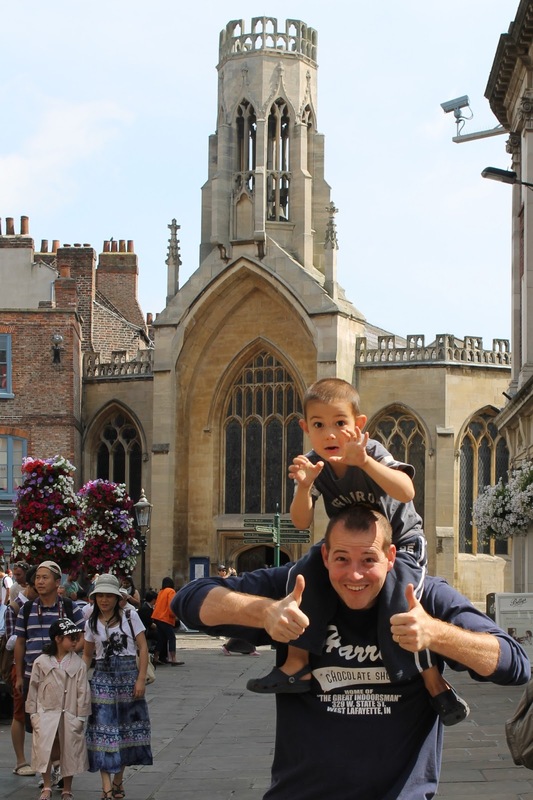 Here are a few tips if you find yourself unexpectedly in York like we did. Park in the city centre. We plan to take a train for our next trip, but since we were in the car, we were tempted to take advantage of the park and ride options advertised on the highway leading into York. I'm glad we opted to drive right into the heart of the city instead. Parking was reasonable (about 8 pounds to park from 9 a.m. to 2 p.m.) and the city was easy to navigate with our sat nav. Grab a map from the hop on/hop off buses. You'll see posted map signs around the city, but it was nice to have something we could carry. Plus, the touristy nature of this bus map meant the highlights for a visitor were clearly marked. Let the weather dictate how you spend your time. By the time we got to York mid-morning, the weather had cleared and it was sunny and 70. 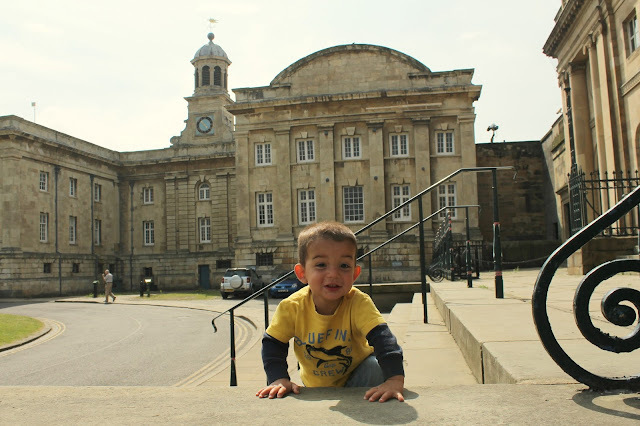 So we skipped the countless museums we walked by in favor of a stroll along the River Ouse and playtime in the Museum Gardens. No doubt, given that it's England, we'll spend some rainy days here, which is when we plan to go museum hopping. I hope to do a proper post (or three or seven) on future visits to York, when I've researched our options and know our way around a bit better. But I'm glad my husband convinced me to allow serendipity to take over so we could experience a wonderful, unplanned day in such a magical place. 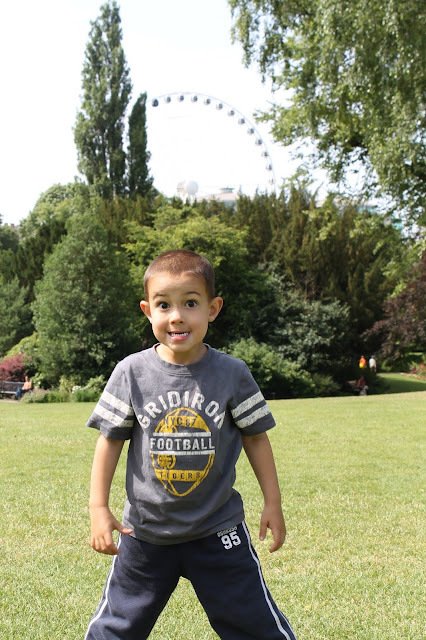 This post is a part of Travel Tips Tuesday at Suitcases and Sippy Cups and Walking on Travels and Photo Friday at Delicious Baby.